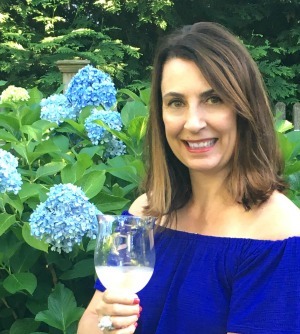 I’m not talking about the pollen that has me running for Zyrtec … I’m talking about budding trees and the promise of patio sitting, book reading (did you know there is a new Harry Potter book coming out this summer that I just pre-ordered), cocktail sipping weather to come. 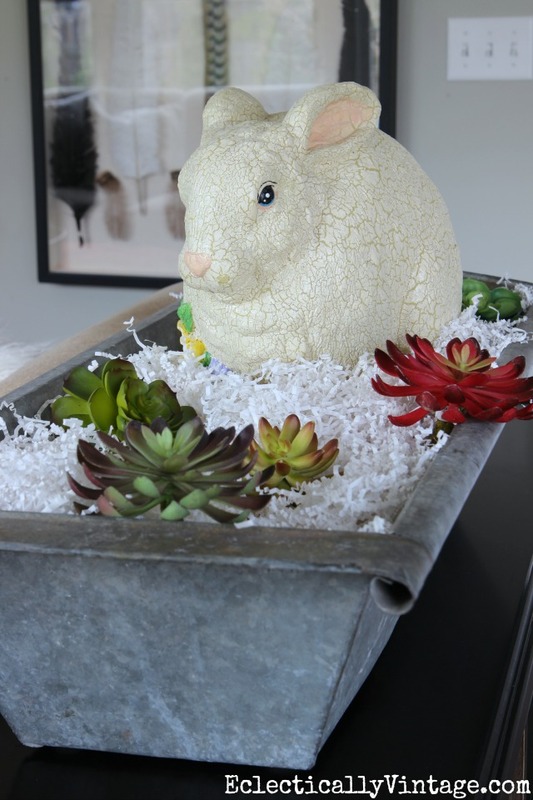 My house is alive with color, greenery, flowers and a few bunnies – come on in (and check out the full source list at the end of this post). 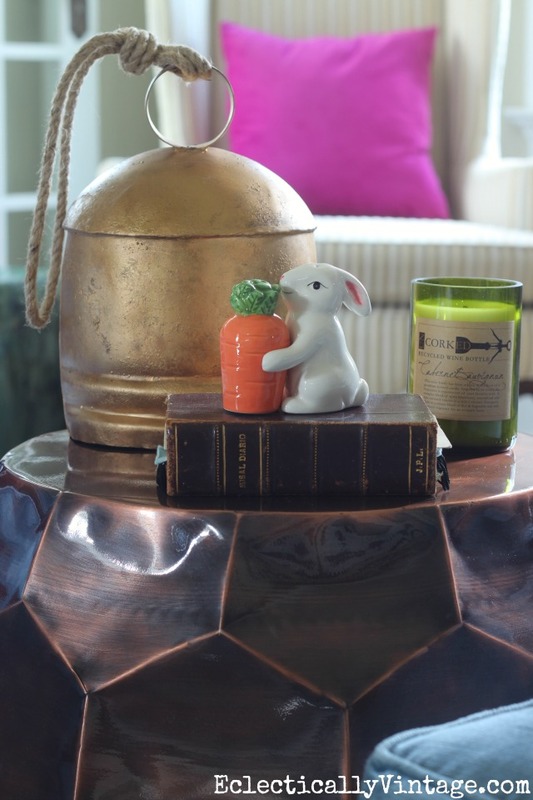 My favorite industrial tiered tray gets some fun spring additions – I love these little green bowls that look like vintage jadeite. 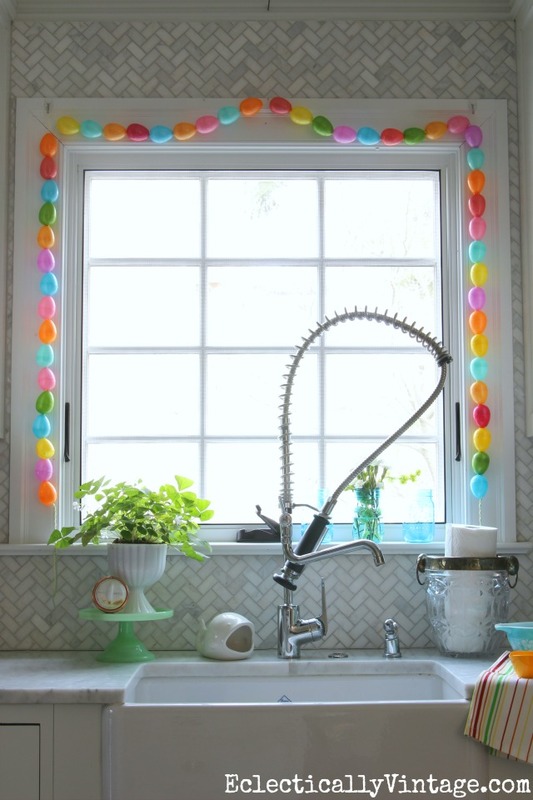 My colorful DIY egg garland adds such a whimsical touch to my kitchen window. 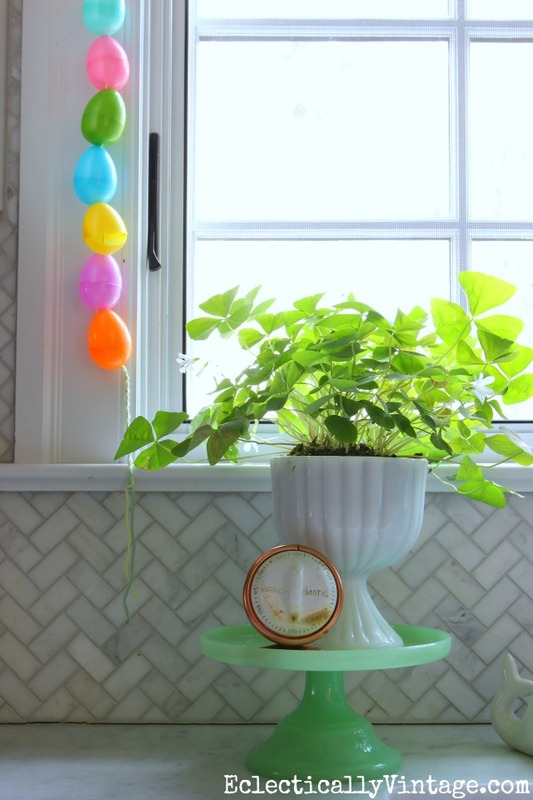 Peter Cottontail makes an appearance in the kitchen and you can print it for free HERE. 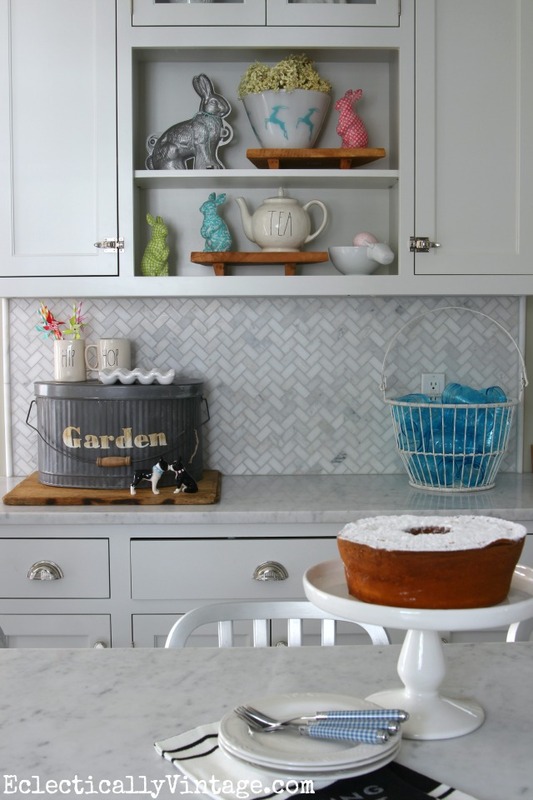 My white kitchen is always such a great backdrop for whatever colors I can throw at it. 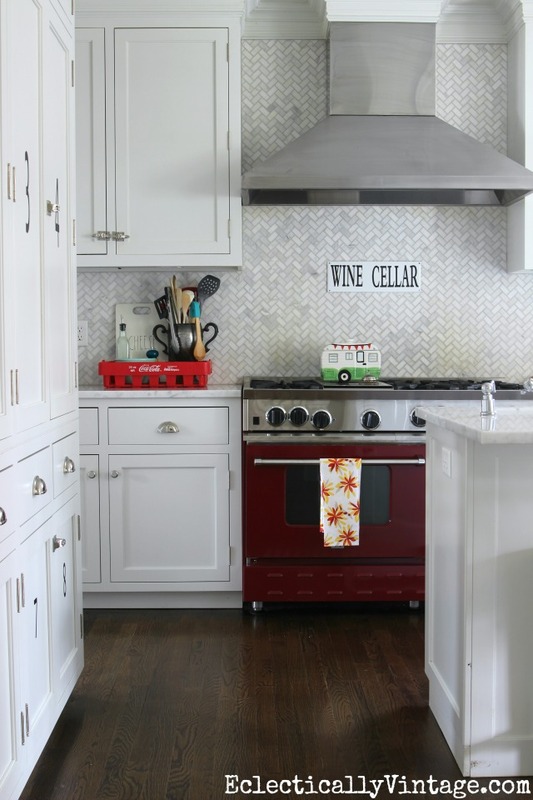 Can you believe I got my backsplash tile here! I found the vintage Fire King gazelle bowl at a thrift store for $3 – I’ve seen it selling for $100. 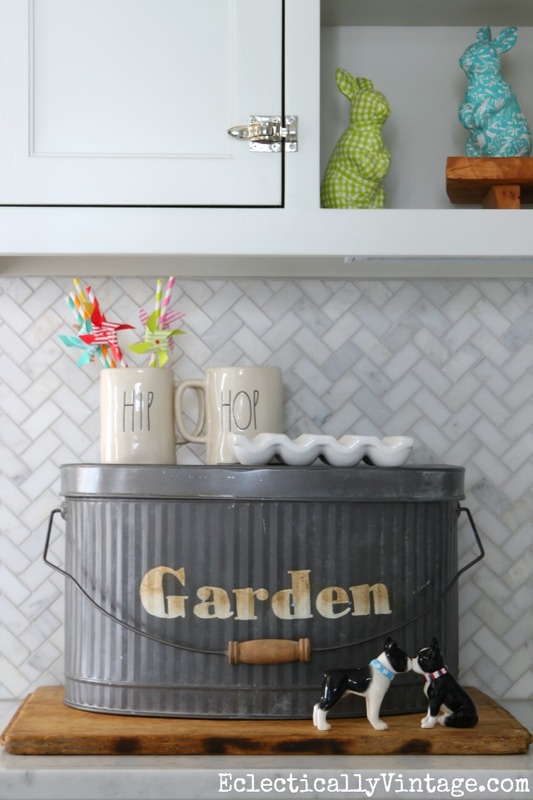 I love using covered containers, like this galvanized garden pail, on my kitchen counter to hide the clutter. 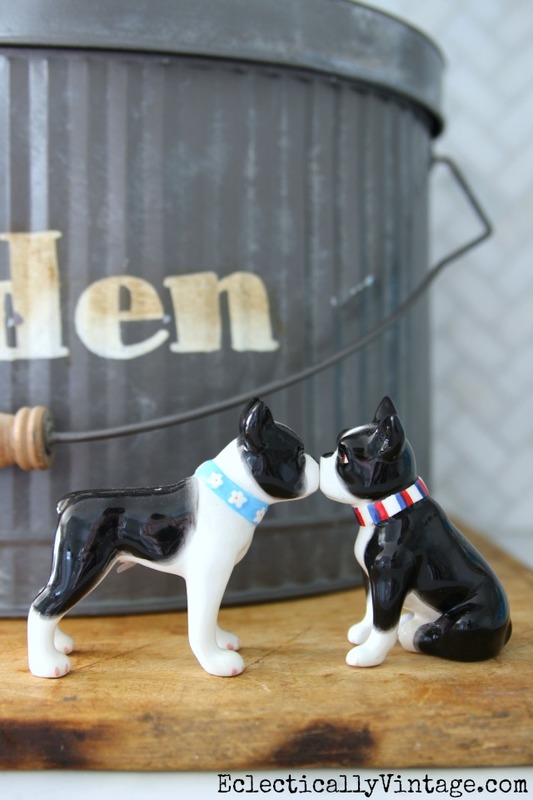 They may be wearing scarves but I have to keep my favorite kissing Boston Terrier shakers out. 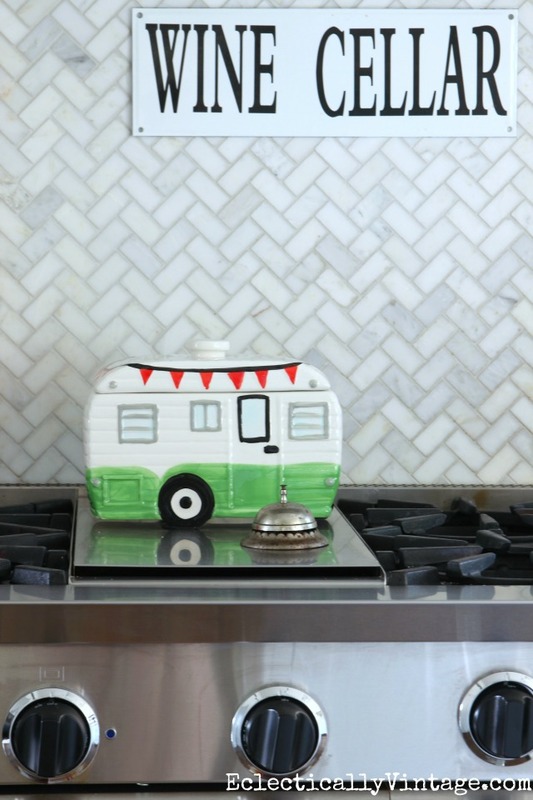 A whimsical camper cookie jar is an easy way to add personality to the kitchen. 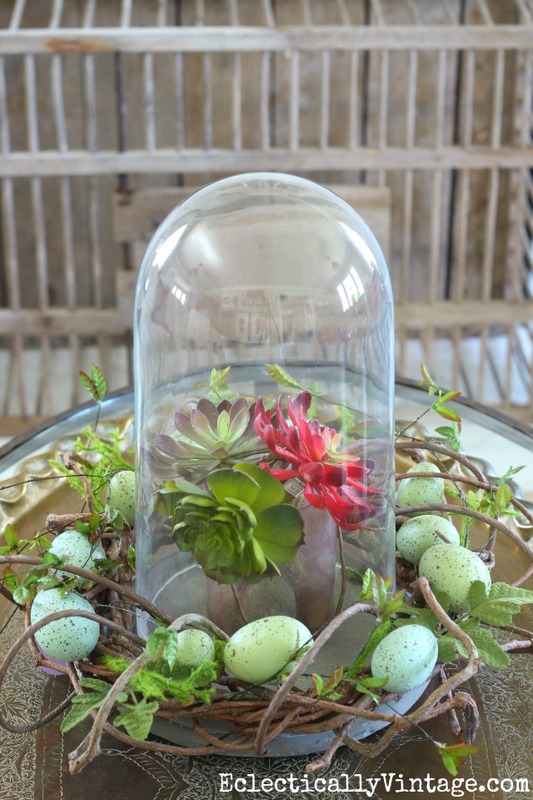 The lazy girls guide to terrariums: put a potted plant inside and surround it with some moss. 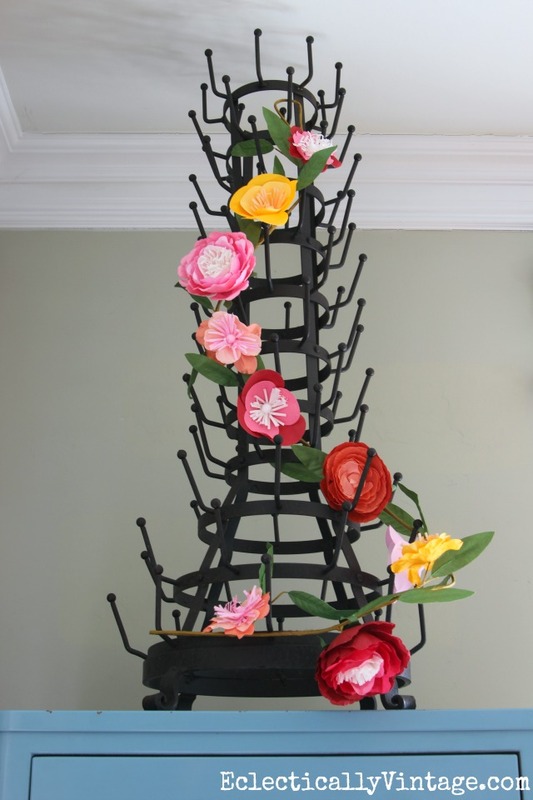 My huge bottle drying rack wears a floral garland. Here’s a similar (smaller and more affordable) version of my rack here. 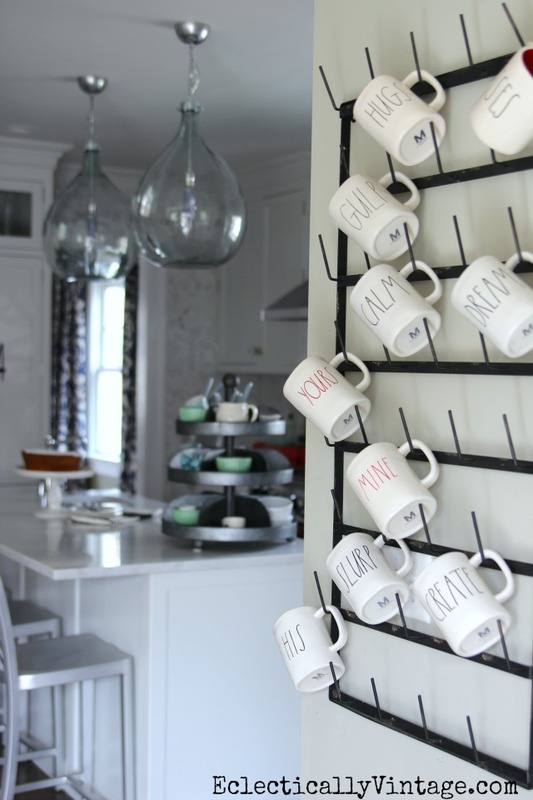 I lost count of how many Rae Dunn mugs from HomeGoods I’ve collected and I love they way they look on display. 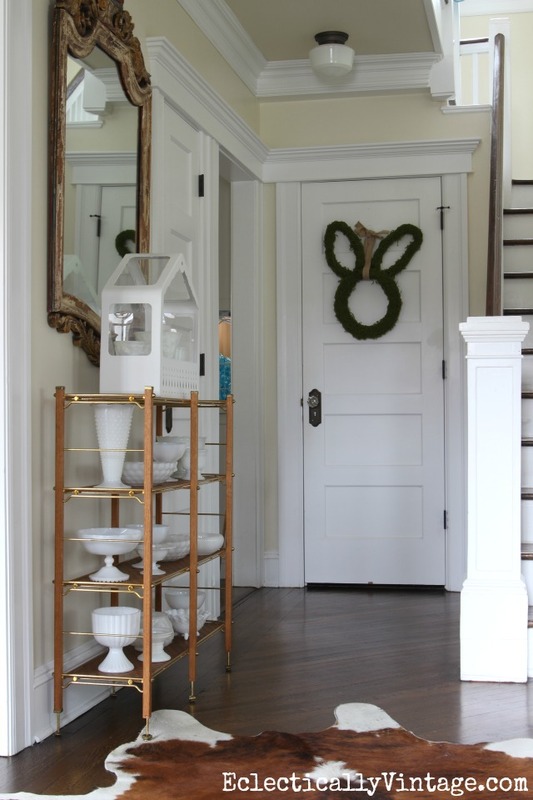 A big grouping of vintage milk glass welcomes everyone into the foyer. 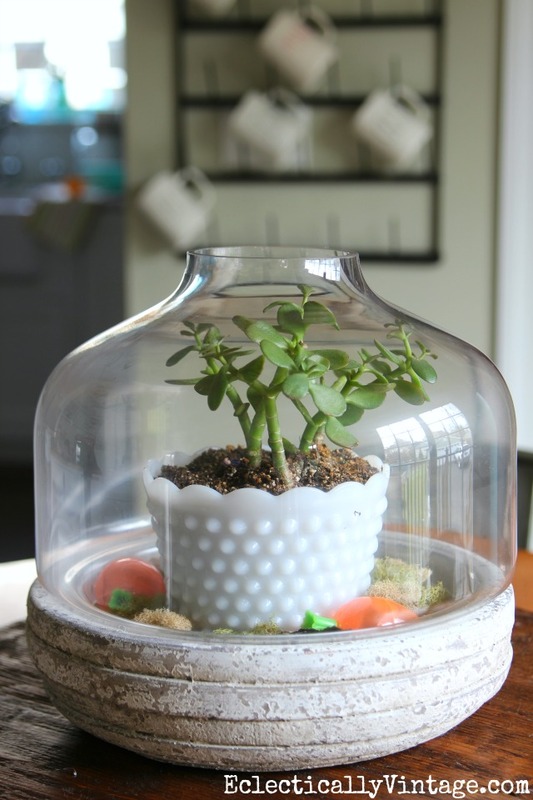 Shredded paper makes the perfect nest for faux succulents. I love my industrial shelves and switching out my displays. 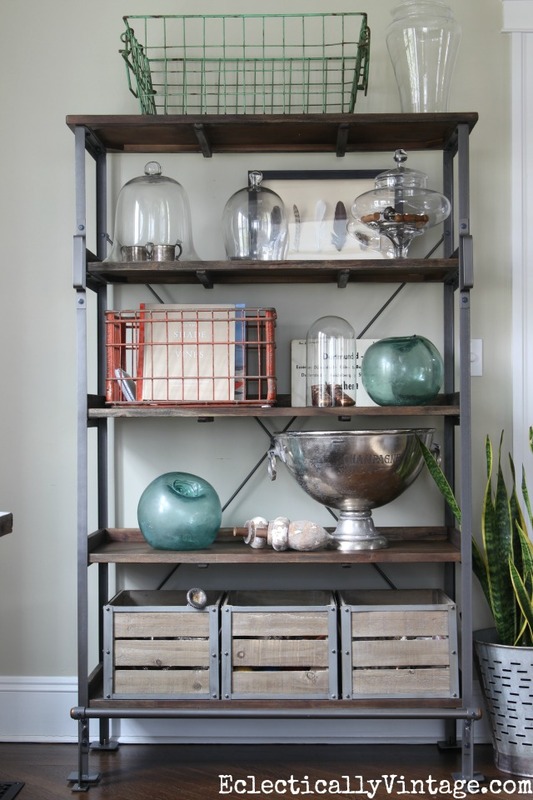 Looks like I have a thing for glass jars and wire baskets. I can hide the black hole of the fireplace now that it’s warm and my old chicken coop is the perfect cover. Now, let’s get outside and enjoy this weather! 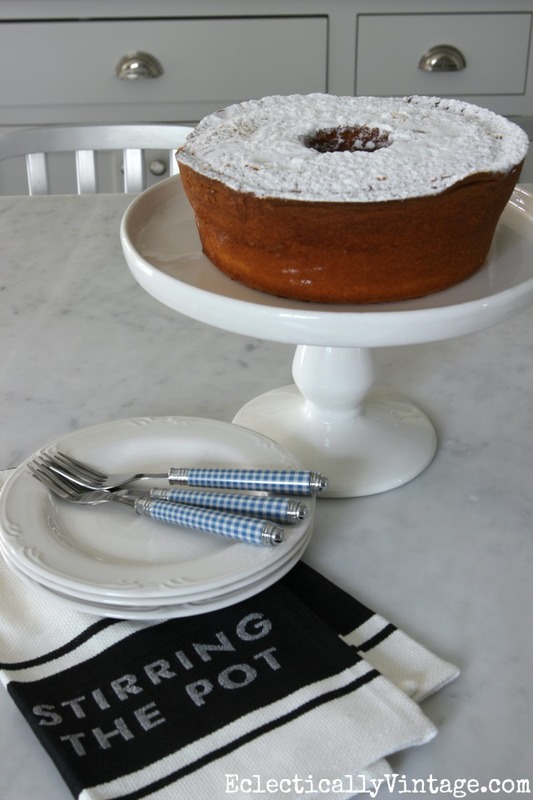 As usual I love your home and the sping-y touches! 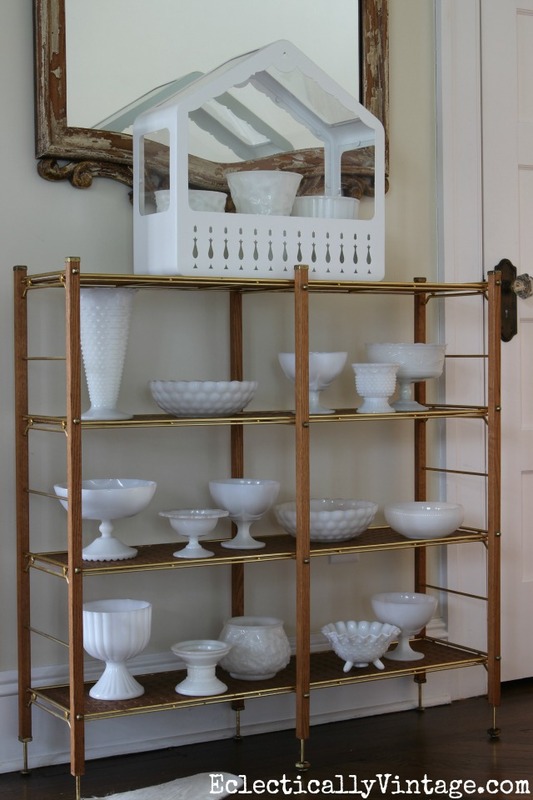 Where did you find your 3 tiered display tray? I love that it is sectioned off. and now i am on the hunt for a vintage fire king gazelle bowl!!!! love your happy cheerful tour! Isn’t that bowl amazing! I leapt at it like a gazelle when I spotted it on the thrift store shelf! Thanks Pat! 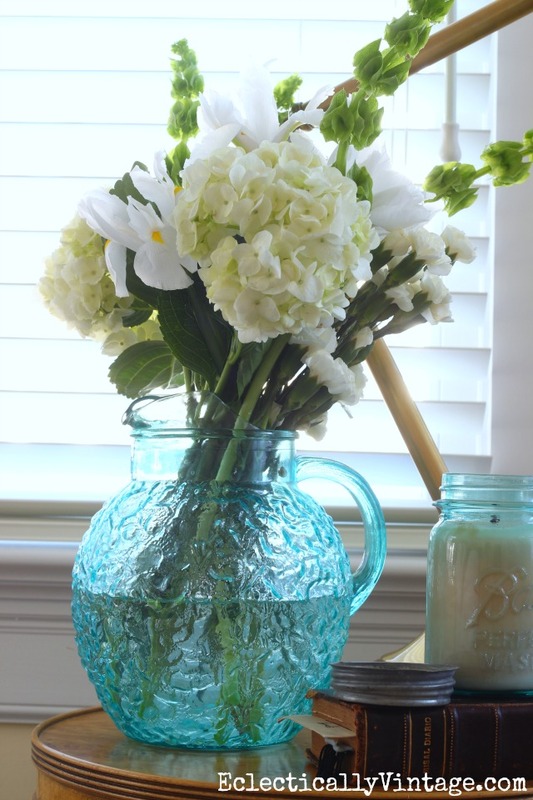 My milk glass was all found at thrift stores by me! Hi! 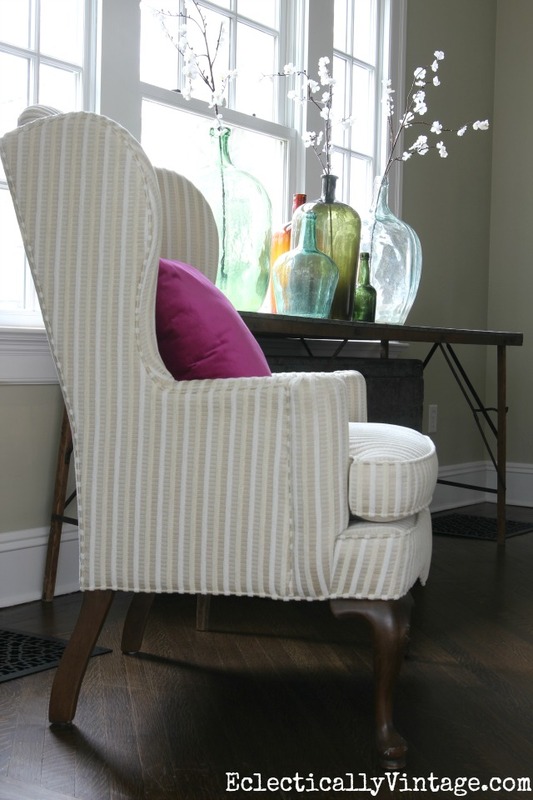 I am new to your site and I really like your home and your style. 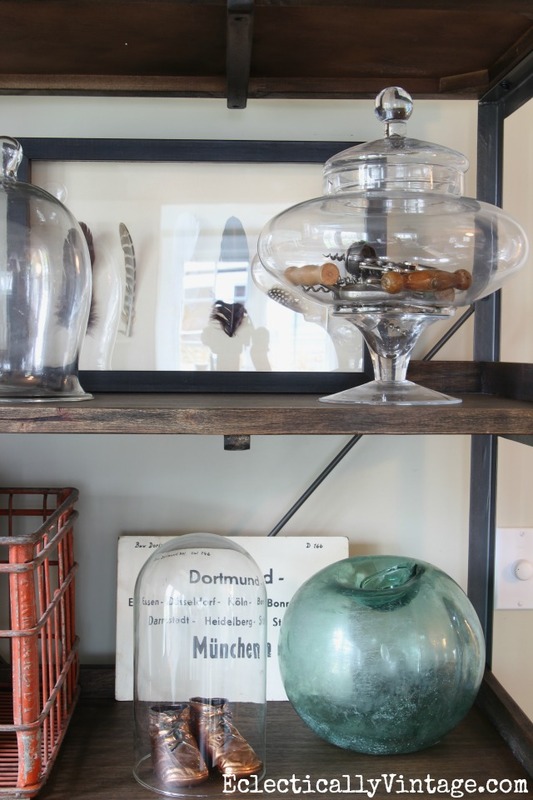 Very creative uses of vintage items. It makes my heart sing! Thank you so much Cathy! My heart is singing a duet with yours! 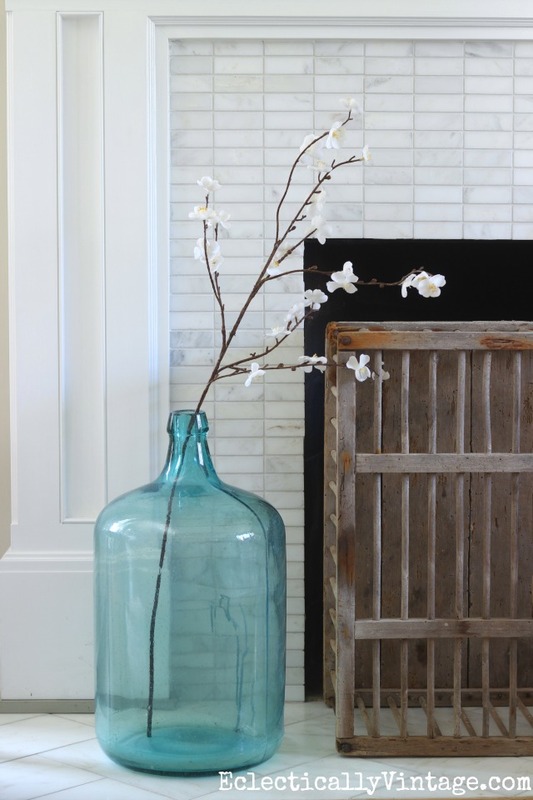 I love how you have so many surfaces for displaying pretty things. Mine all get cluttered up with the daily minutiae of magazines, mobile phones and cables / rechargers for said phones, dog leads, torches (for taking dog out for last toilet before bed) keys, dishes and pans and so on. 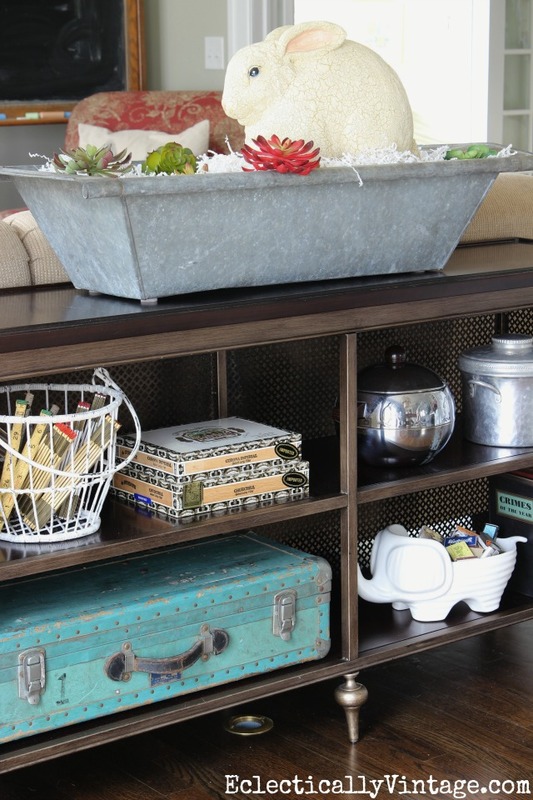 Where do you hide all your necessary junk? Must have lots of storage space. Envious sigh! Love all your pretty displays. Thanks Carole! I do have lots of clutter. 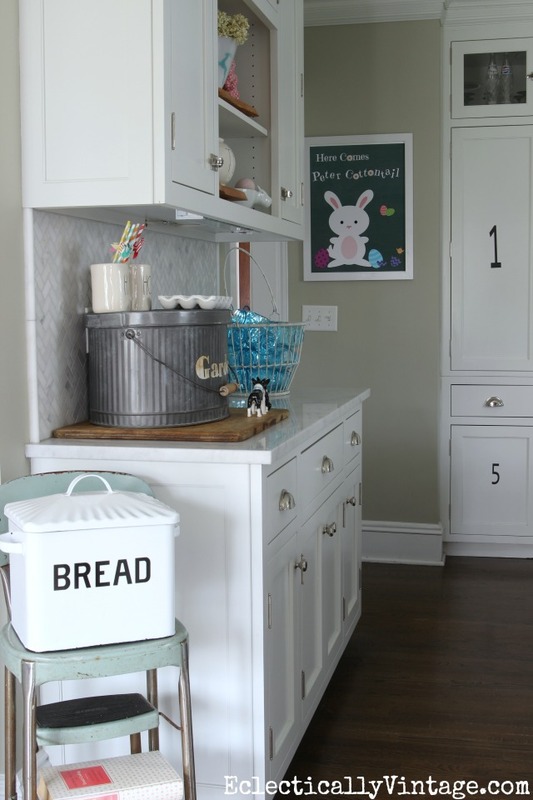 My kitchen desk, mudroom and kids areas are always messy. Oh and if you ever saw my basement and garage, you’d he horrified! It’s a constant battle!! 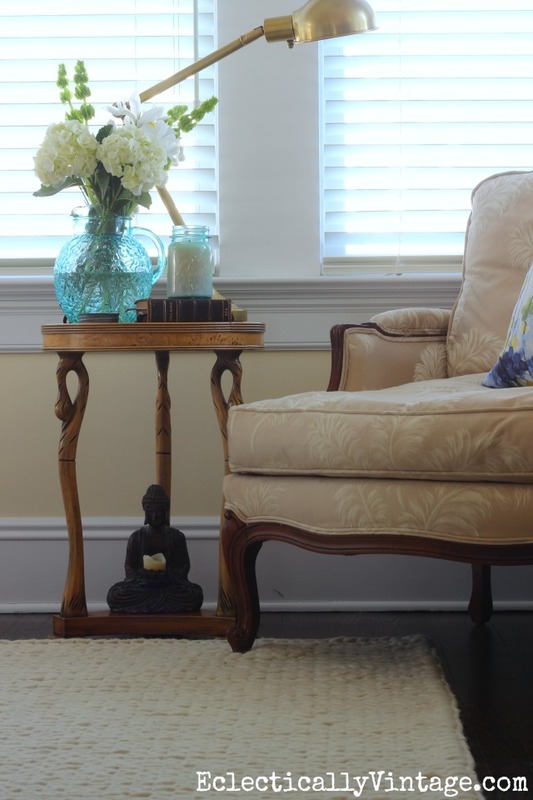 I love your house , it is such a great place for you to raise your family and you always know how to decorate to make it exceptional! Love all your bunnies and doggies so cute! thank you so much Marlene! 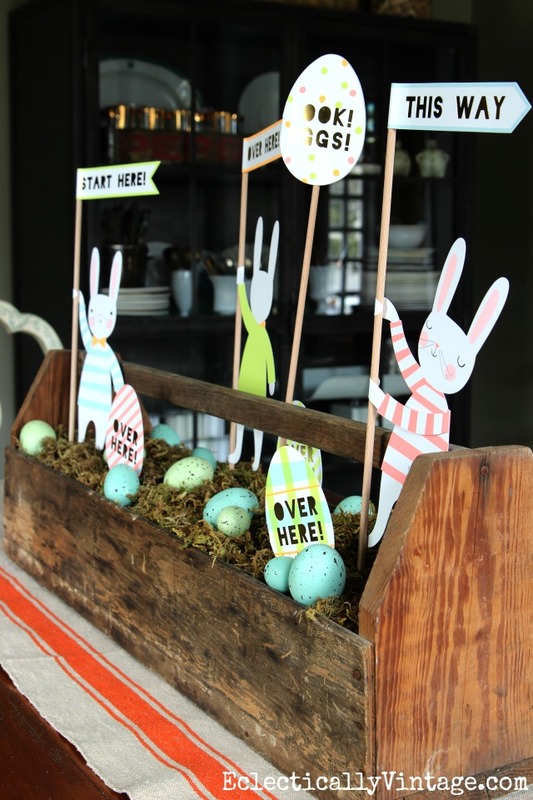 I hope you have a wonderful Easter! My pup Sushi sends her love too! 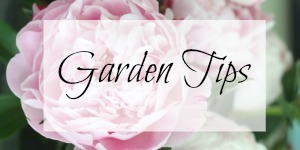 your home always looks so fun for any season. 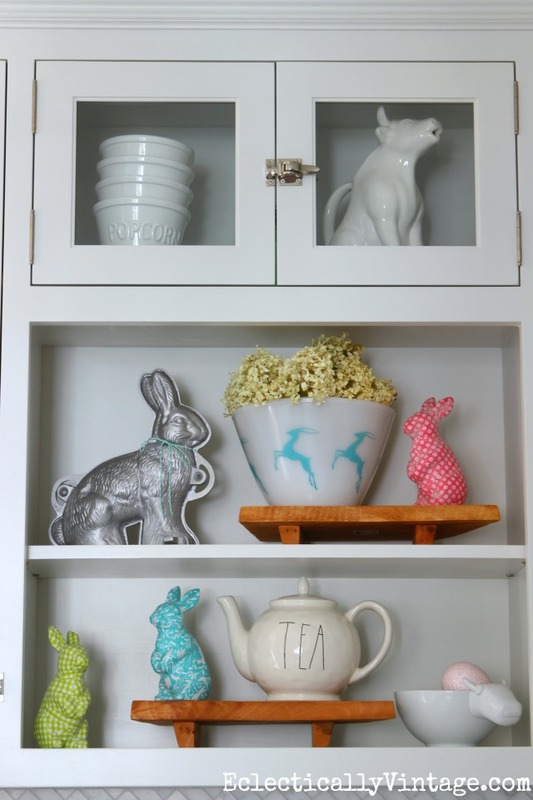 I love all the whimsical details sprinkled around the house. Happy S pring! 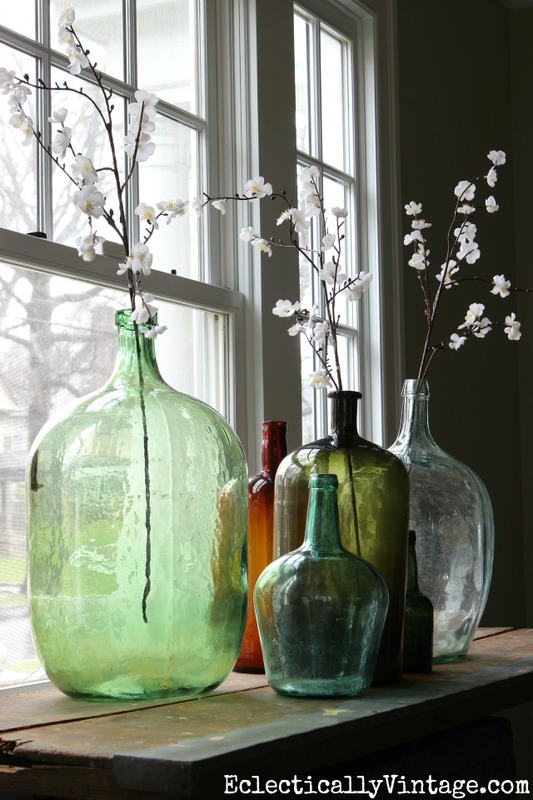 Where did you find your collection of green and blue glass jugs that you have displayed by the window? 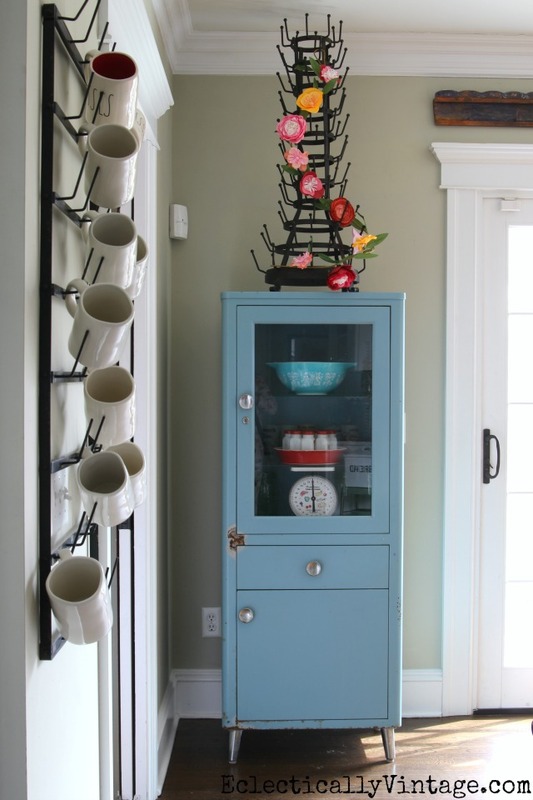 I love the grouping and the colors! 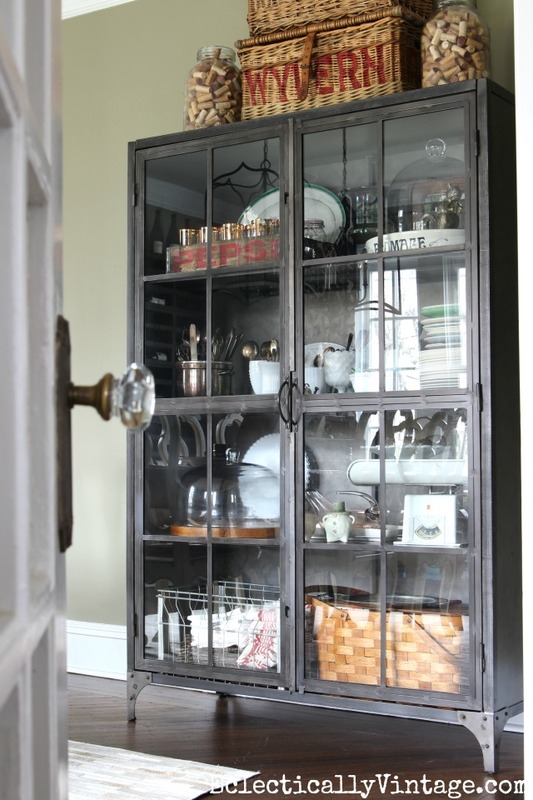 I’ve found my demijohns at different flea markets over the years – aren’t they amazing! Hello!! I am in love with your pendant lighting over your island ? Where did you find these? I’ve been looking for months and haven’t found anything close to what I want. Your house is so beautiful! 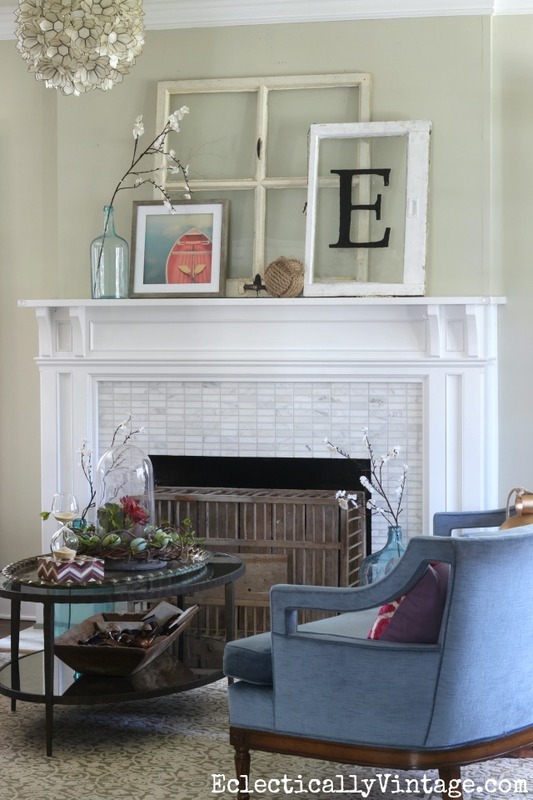 Hi Kelly, Your home looks so fresh and ready for Spring! 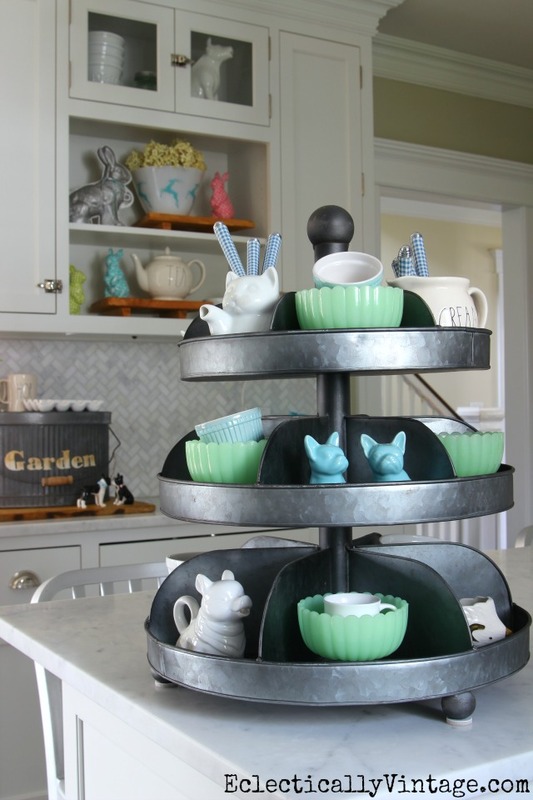 I fell instantly in love with your marvelous tiered tray! 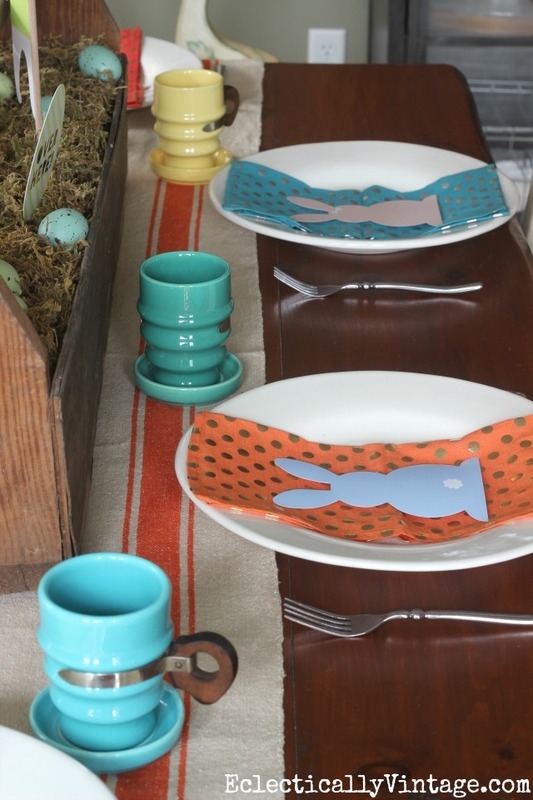 The colors and whimsy you used to create your tray made me smile (with envy 🙂 ) All of your spring touches are both beautiful and delightful, thank you for sharing your talent and creativity! Thanks Judy and happy spring!